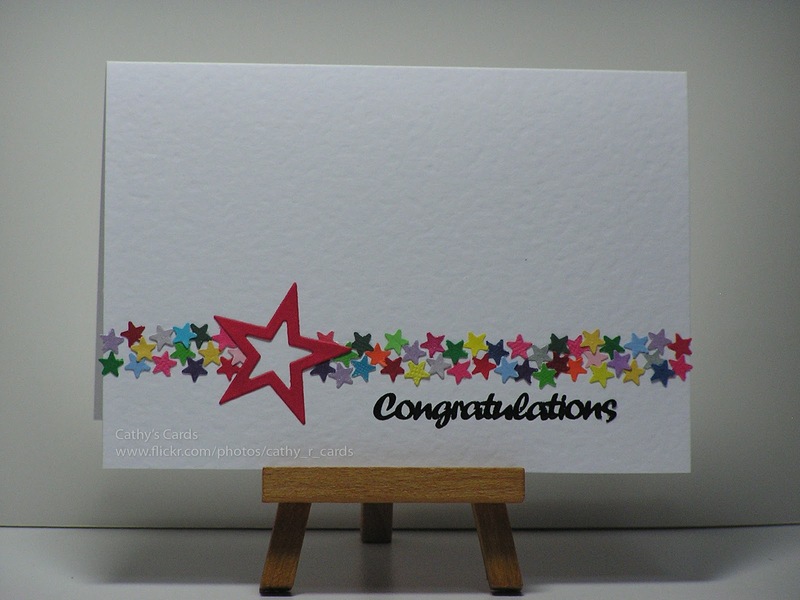 Cathy's Card Spot: Congratulations star! 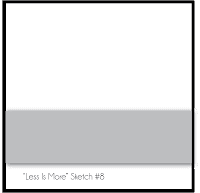 Hi, this is my entry in this week's Less is More challenge. I've only tried a few sketch challenges and this one looked simple enough for me. This week we have a sketch for you drawn by Jen. It's simplicity itself, so to add a little constraint, we ask that the card stays in this orientation ie that the band remains in the horizontal plane, in the lower part of the card and that it takes up no more than 1/3rd of the height of the cardbase. I'm also linking this card to http://pixiescraftyworkshop.blogspot.com.au/ where the challenge is to use snippets! Thanks Viv for the details. I hate wasting cardstock, so I punch any small scraps that I have and save them in a little drawer. It's nearly overflowing! Thought this sketch would suit a star confetti card! I tried putting a patch of glue down and sprinkling the stars on but found that individually gluing each one in place was better. Materials used: Fiskars star punch; My Favorite Things star die; sentiment sticker from stash. What a clever idea and a very striking card - I think I'll be CASEing this one! Just goes to show that crafty people hoard everything! You'll have to come across and join us in the playground with our 'Snippet' cos this is fab! (http://pixiescraftyworkshop.blogspot.co.uk/) if you're interested! Wow Cathy, so much work!! It's just perfect all the stars are stunning - and welcome to the Playground, it's raining out there right now so put your wellies on!! Beautiful Cathy, you must have the patience of a saint! I save all the tiny scraps and punch them too, leaves, flowers, snowflakes, etc. I love the large star and the sentiment, really pulls it all together. Waving hi from Less IS More and the Playground too! cathy this is a fab take on my sketch!! It looks like Jen really inspired you this week Cathy. This looks fab! We would be really grateful if you could remove the Word Verification from your blog thanks! Wonderful use of snippets! I punch and diecut lots of my scraps too...I find it so handy when I need a card in a hurry or my girls or grandchildren want to make some cards. Your desin is wonderful. I love how you placed the big star and then worked around it. great take on the sketch! lovely creation! Goodness me . . . you have lots of patience sticking those stars down! Lovely result though. Hope to see you on the swings now that I've come out of the treehouse cuz the sun's out! Heh Cathy, what a stunning card, love the colours. You certainly have some patience to stick those tiny stars individually but it paid off cause its brilliant!